South African species A-B are found on this wiki page. 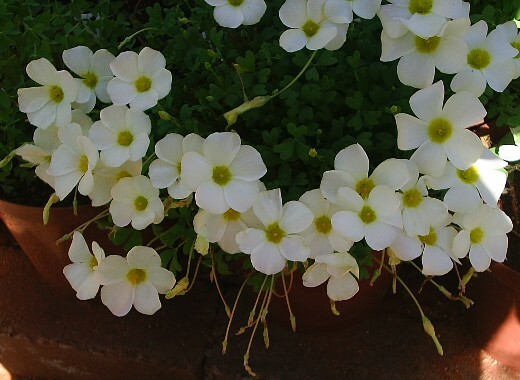 Oxalis adenodes is one of my favourites. This species is quite variable in size and degree of hairiness, and has a large geographic distribution, mostly in Namaqualand, but also extending into Bushmanland. The second photo was taken near Kamieskroon. Photos by Christiaan van Schalkwyk. 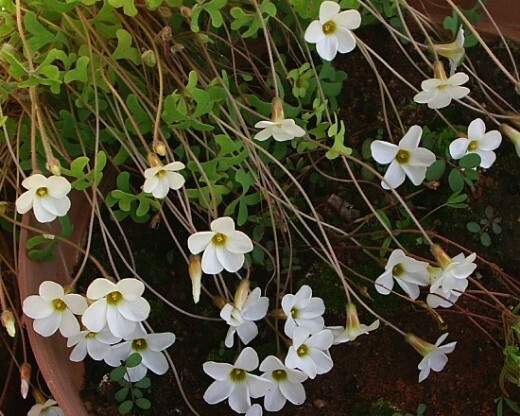 Oxalis ambigua is described as having 3 hairy leaflets and white, yellow, or cream flowers with a yellow tube and blooming in winter. The species is found in rocky hills of Namaqualand and on the Gifberg in succulent Karoo biome. The photos below by Mary Sue Ittner are of two Michael Vassar collections. 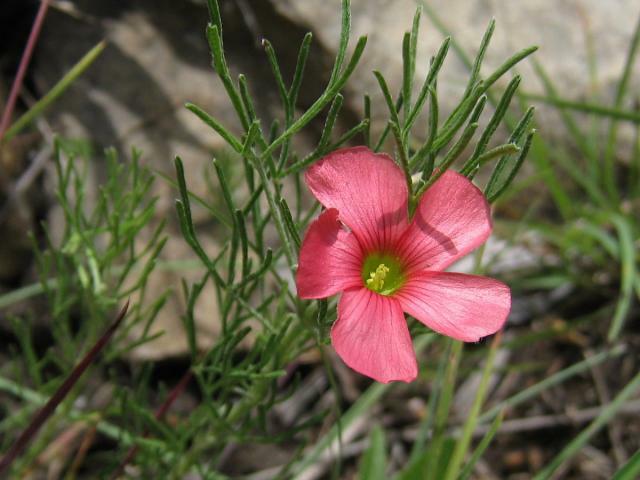 The first, Oxalis ambigua MV4967 was collected 19.2kms south of Calvinia. The collection data noted large copper salmon flowers held above the leaves. 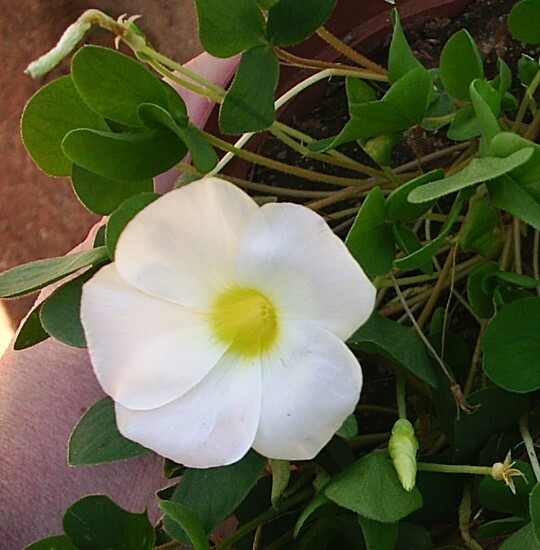 My plants rarely flower, but when they have, the flowers were white. The second, Oxalis ambigua MV5532 was collected by Michael Vassar 123 km. south of Pofadder. 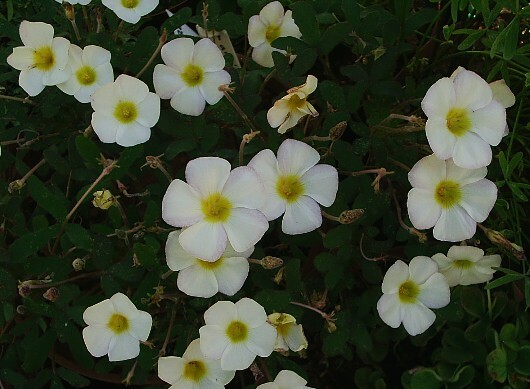 It has ivory flowers with a yellow center and nice bright green leaves and blooms for me in the fall and does not seem happy with excessive winter rain. The first two photos below are from plants west of Kamieskroon, the third from South of Kamieskroon. Both are hirsute forms, but note the stem in the second photo. Not all plants or colonies are caulescent, and the acaulescent forms are more often seen. The leaflets of the western plants are much narrower than those South of Kamieskroon. Photos by Christiaan van Schalkwyk. 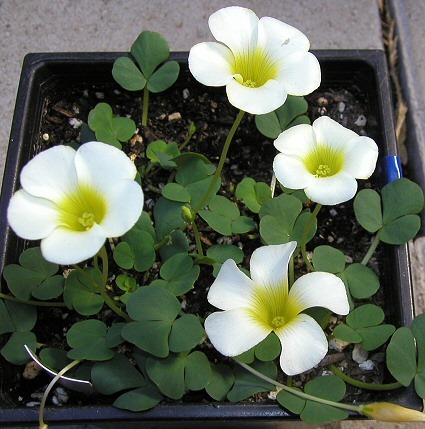 Oxalis annae is a very variable species, this particular clone is villose, white flowered, and floriferous. 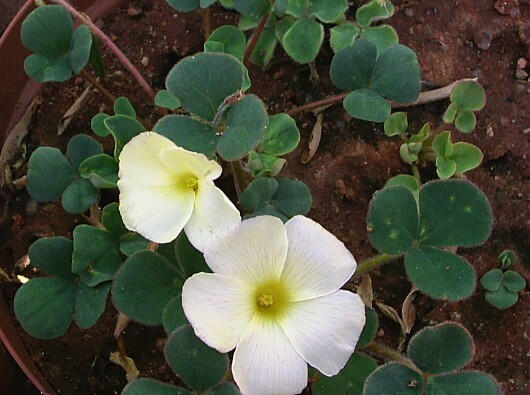 Oxalis annae can be found over a large geographical area, and several colour forms have been recorded. This one is from west of Garies. Photo by Christiaan van Schalkwyk. 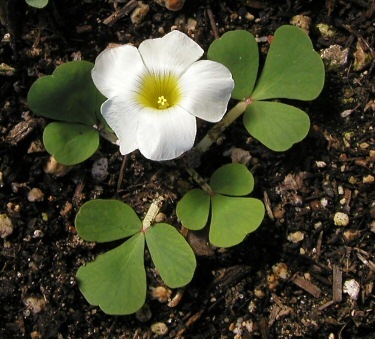 Oxalis anomala is a fairly large, stemless plant. The peduncles are one or two flowered, and are much longer than the leaves. The flowers are rosy-violet in colour. 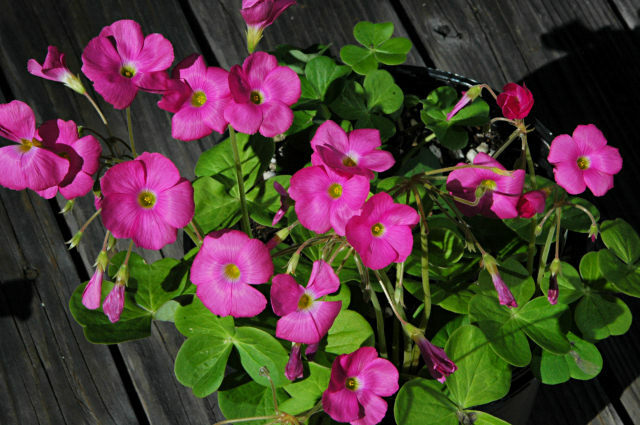 Plants cultivated under this name is most commonly Oxalis virginea. Oxalis argillacea is quite a hairy species, only the corolla is glabrous. The red marks in the flower is not distinctive, and apparently rare. This species can change dramatically in size from year to year, depending on weather conditions. It is found in the Vanrhynsdorp and Calvinia districts. Photos by Christiaan van Schalkwyk. Oxalis attaquana has long shiny hairs (not seen clearly on the picture). 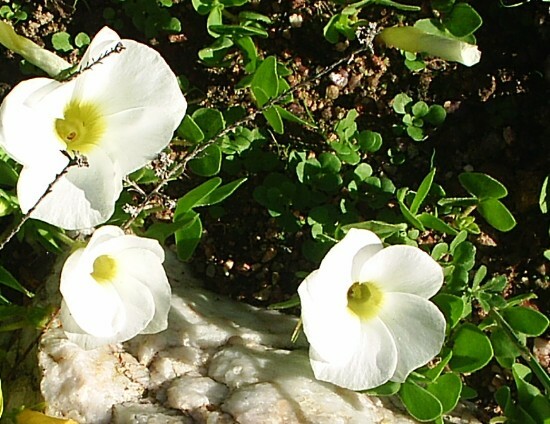 Fairly small white flowers are borne in masses. The literature states that it an erect plant, but I guess my overfeeding and watering causes it to topple over. 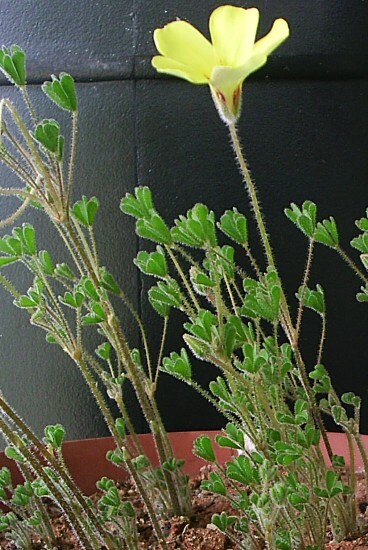 The shape of the leaves is quite unique in shape (obreniform) and the leaves are slightly succulent. 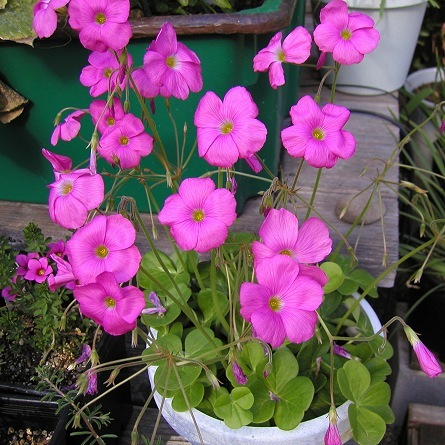 I have received a plant labelled as MV4621B Oxalis imbricata var. violacea which I believe is a misidentification. 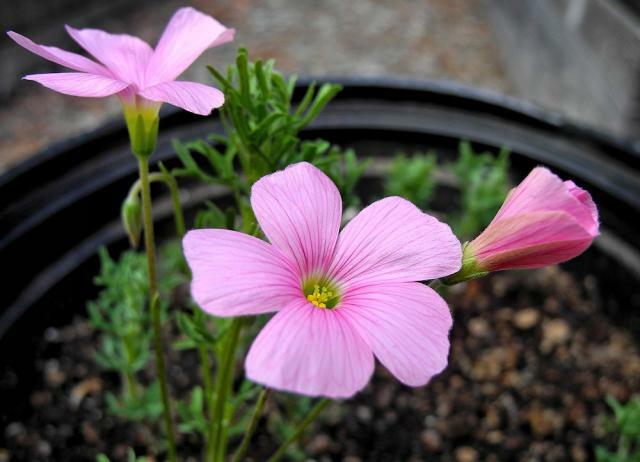 It is identical to this plant, except for its pinkish flowers. Photos by Christiaan van Schalkwyk, the bulbs on a 1 cm square grid. 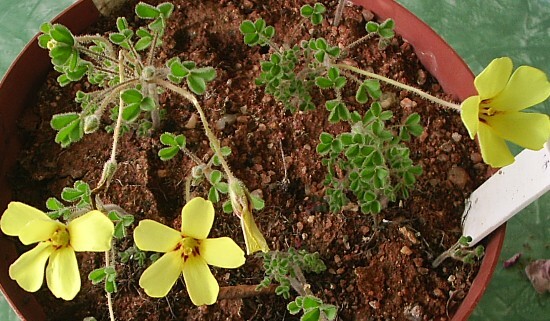 Oxalis bifurca is a species with some confusion. 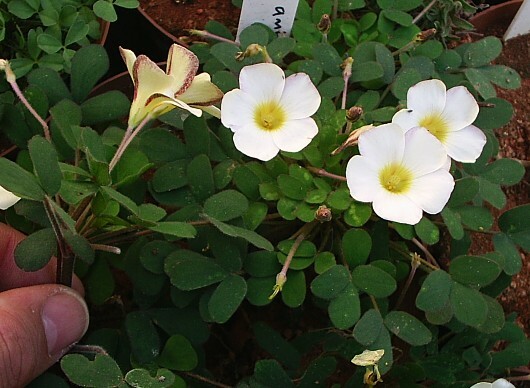 SANBI lists two varieties: Oxalis bifurca Lodd. var. 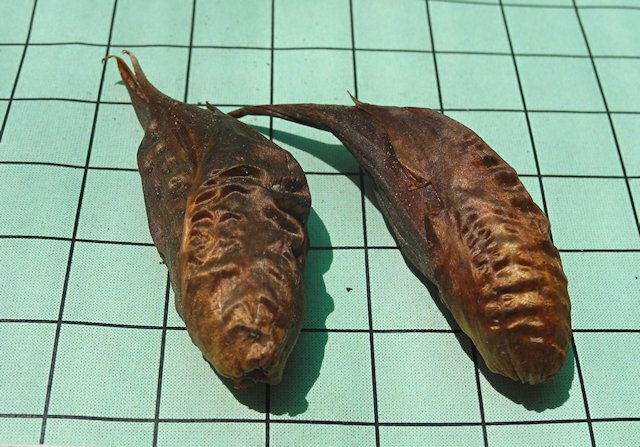 angustiloba Sond. and Oxalis bifurca Lodd. var. bifurca. 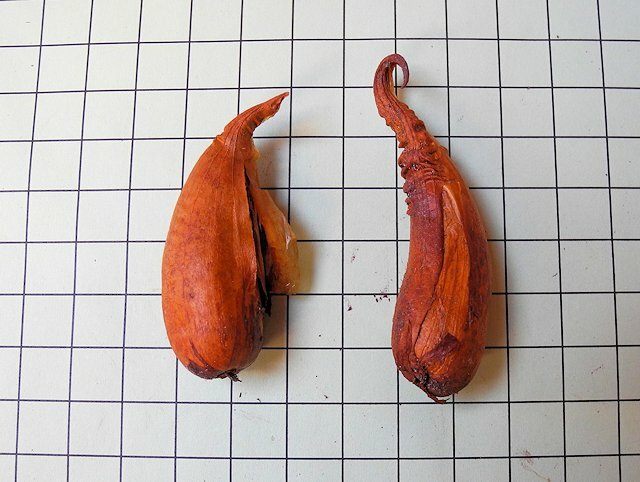 The Plant List categorizes this species as unresolved. 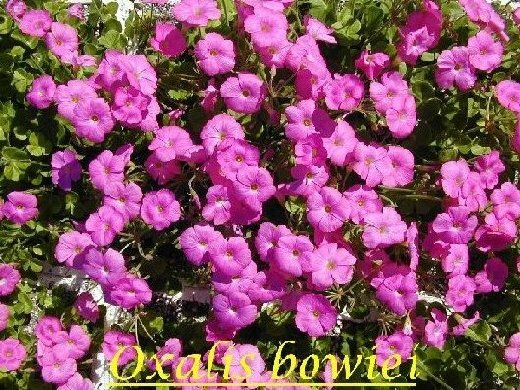 It is described in South African Wild Flower Guide 11 for the Eastern Cape as distributed in coastal grassland in the Eastern Cape. Also as having scattered leaves that are divided into three deeply forked leaflets that are silky below and hairless above and solitary white, rosy purple flowers with a yellow tube. Flowering is listed as occurring from August to October in the southern hemisphere, but Salter lists this species as flowering in summer (into fall), January to April. The first photo from Cameron McMaster was taken in the Eastern Cape mid January 2008. The next three photos were taken by Mary Sue Ittner of plants received from the BX showing flowers, leaves, and the bulbs on a 1 cm grid. It was flowering for her in the northern hemisphere September-October 2014. Ernie DeMarie, the source of the bulbs in Mary Sue's photos reports that his plants start into growth late summer. From a distance the top of the leaves look hairless, but with a lens and because the bottom of the leaves and margins of the leaves have long hairs the impression of the leaves is not that they are hairless as can be seen in the leaf photo. 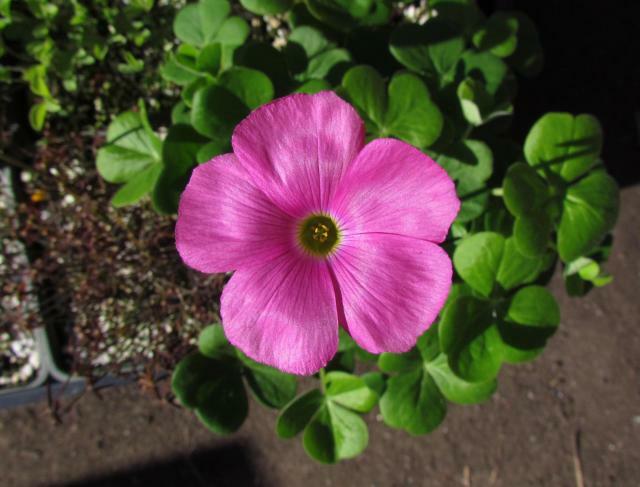 Oxalis bowiei is a fall blooming species from the Eastern Cape of South Africa with more than one large pink flower per stalk and leathery trifoliolate suborbicular-obcordate leaves. 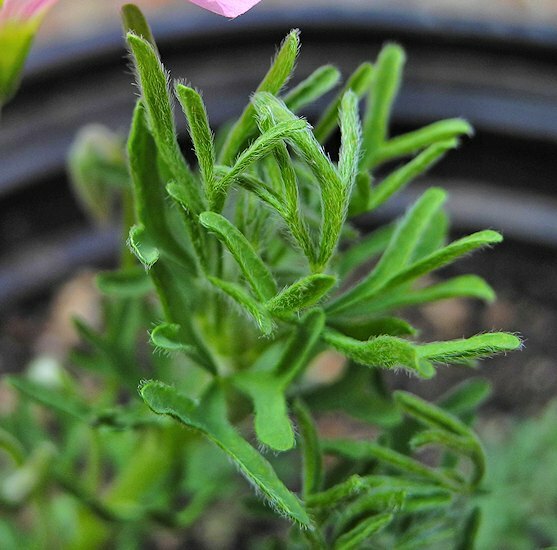 Even though it is from the Eastern Cape, in cultivation in northern California, it behaves as a winter grower. Photo 1 was taken by Bob Rutemoeller, photo 2 was taken by Bill Dijk, 3 was taken by Nhu Nguyen and photos 4-5 were taken by Mary Sue Ittner. 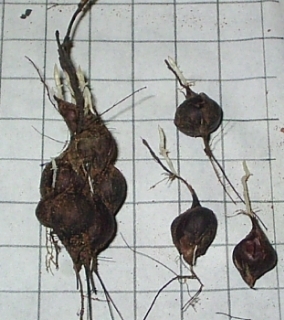 Photo 5 shows the large bulbs on a 1 cm grid.